Last week, it was National Conversation Week, a whole seven days devoted to getting us out and talking to our peers. In light of this, we decided to get out and chatting to some of our local businesses in the city centre. As the general gist of National Conversation Week was to engage with the people around us, whether that be those we care about or even a work colleague (we’re all guilty of sending an email instead of picking up the phone), we got out and talking to the lovely lot at Browns, and into the spirit of having a good ol’ chat. Perched on the edge of the city’s Peace Gardens, Browns Brasserie and Bar used to be the city’s Army and General store. Steeped in history and in the perfect spot if you fancy watching the city go by while enjoying some amazing food, Browns is a must when you’re in the city. 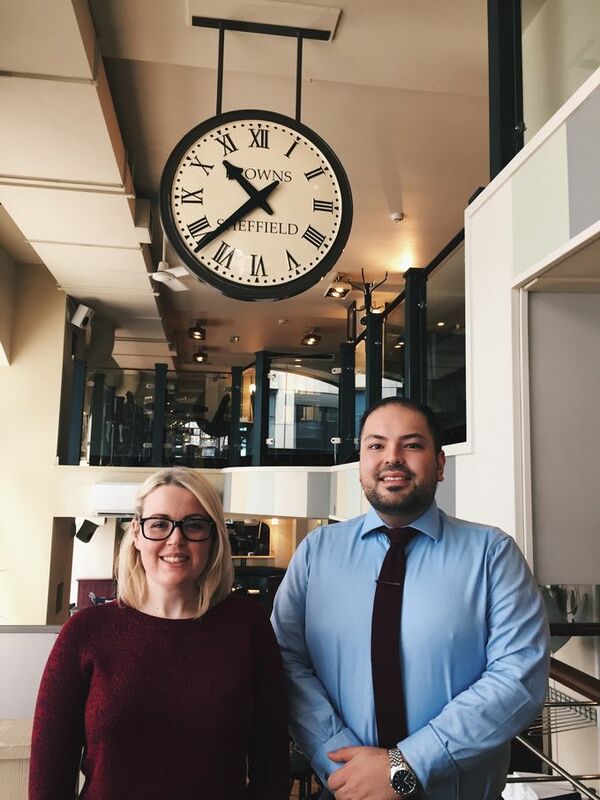 We caught up with Sales Manager Sara and General Manager Jason for a quick chin wag over a cuppa. "Engaging with Sheffield BID has been really important, especially for local businesses in the city. It is really positive for the community. As a result, our streets stay clean, and you notice, especially around busier periods like Christmas, that there are a lot more people out and enjoying the city. It’s just the little things that help make the streets that little more pleasant, and we can thank the street cleaners for that. As a business, what is it that’s so special about Sheffield? We absolutely love Sheffield. For us, it’s like a big village – even though it’s a huge city population-wise – everybody knows everybody. Visitors notice such a friendly atmosphere when they come here, which is genuinely unique to Sheffield. That’s why people keep coming back. Sheffield is a safe city and is nice and green. It remains a hard-working city, however people don’t let that get them down; they know how to have a good time when it comes to the weekend. The city is diverse; we’ve got a nice collection of different people from all over the world, yet we still have that sort of community mentality. Dine Sheffield is well under way in the city centre. How’s it been going for you? We’ve been doing really well; more than half of bookings we’re taking are making use of the Dine Sheffield deal. We’ve worked hard to get this offer available, and it’s been worth the wait. Most of the items are from our new spring menu, which means it’s a great opportunity for people to sample the new dishes. We’ve also had some great feedback around Dine Sheffield. Everyone’s had a really lovely time, it’s nice to see people enjoying it and choosing Browns over so many other restaurants in the city. In spirit of National Conversation Week, who was the last person you texted? Could you gave given them a ring instead?